Every time I see someone post a picture of a green smoothie that contains avocado, I squirm. Avocados are for guacamole. You put them on top of your toast and sprinkle it with sea salt. You can totally sub them in for mayonnaise and make a Green Egg Salad. But, smoothies? Really? Is it a guacamole smoothie? I’m not sold. Why is this happening? I just can’t hang. I’ve been mistrusting of any and all humans that have muttered the words “avocado pudding” or claimed to make a great “vegan avocado brownie”. Shudder. Like most of my food aversions, I decided to just dive right in. Challenge accepted. Guacamole smoothie, I’m coming for you. I remembered back to when I did my whole 30. The times when I would troll the internet asking the most important paleo questions, such as “CAN I PUT CHOCOLATE IN MY MOUTH AND STILL BE PALEO?” or “PALEO. CHOCOLATE. DESSERT. CAN I?” Always asked dramatically and sincerely with my whole heart, and ALWAYS in CAPS because I meant business.One of the recipes that would always pop up was a gosh darn chocolate shake made with (you guessed it) avocados. I quickly dismissed this as strange brown guacamole, and started digging into the archives of blogs that promised me “gooey paleo mug cake”. I know what I like. But now, in my search to seek guacamole smoothie redemption, I reflected upon my past Google searches and wondered quizzically if there was indeed something to these recipes. Maybe I had judged the chocolate and avocado smoothie too harshly (yes). Maybe I had totally jumped to conclusions (yes). Humbly, I returned to my blender, ingredients in tow. Let’s get serious. I scooped the flesh of an entire avocado into my blender, along with half of a frozen banana, almond milk, cocoa powder, a handful of spinach (because, why not) and HONEY. I mark the enthusiasm for the honey with my caps. It’s the secret weapon. The end result is creamy, sweet, and chocolaty. 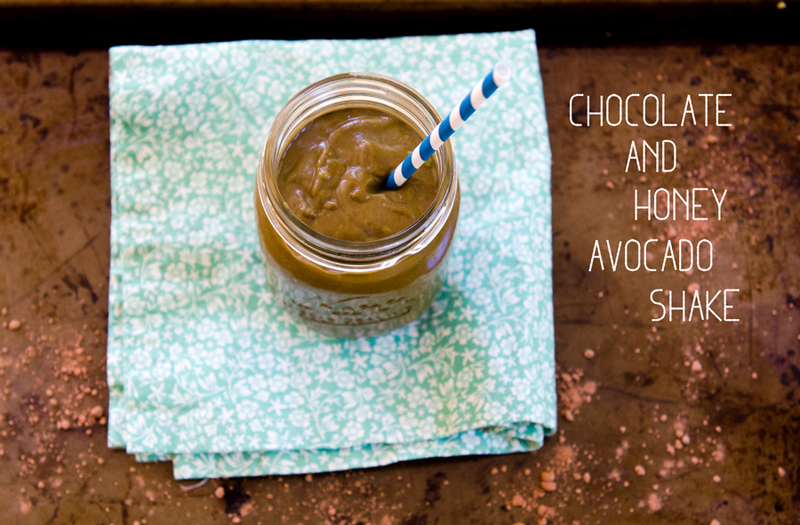 The avocados need sweetness to balance out what can taste bitter when blended. We win. This is not dirty guacamole. I promise. Next step, avocado chocolate mousse? Yikes. Let’s just take this one step at a time. 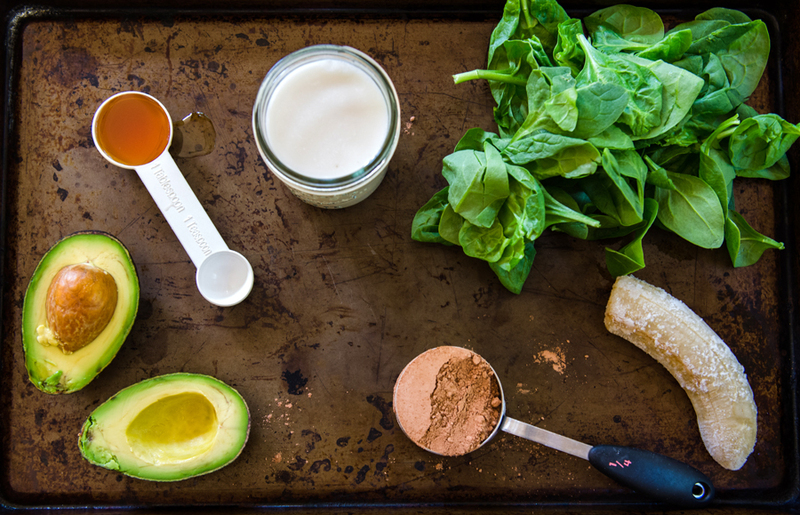 Scoop the flesh of your avocado out into your blender and add the rest of your ingredients as well. Process on high until all of the ingredients come together and are a smooth consistency. Add a couple of ice cubes to make it cold/thicken it up and process again until smooth. I am going to make this immediately! Yes! Go forth and shake! so did you include the banana or no? Thanks for pointing that out. I fixed the recipe. It does include half of a frozen banana. I want to increase the nutritional value just a bit. I’m going to add a blend of berries (strawberries, blueberries, and blackberries) to mine aswell as some maca and ashwaghanda extract. I’ll have to let you know how it is. Thank you for the base recipe! I made one just today. I used frozen avocado, frozen banana, soya milk, cocoa powder, almonds and coconut sugar. To my dismay, it tasted bitter. I am pretty sure I used ripe avocados. I don’t know if it was because of the unsweetened cocoa powder but I’m afraid to try doing it again.